Make plans for the weekend to get outside and enjoy some of the seasonal change from winter to spring. This week I’ve led trips at Hoopes Reservoir, Ashland Nature Center, Burrows Run Preserve, Auburn Heights State Park, and Bucktoe Creek Preserve. We’ve seen a lot of examples of both winter and spring on our programs lately. There is a lot of change happening in the natural world right now, from frogs emerging and laying eggs, to new birds showing up in their spring migration. Tree Swallows and an Eastern Phoebe have returned to Ashland this week. Take a look at the video below to see some highlights. The snow has melted, and the streams and wetlands are full. Many wintering birds are still around including the White-throated Sparrow and Golden-crowned Kinglet (look fast!). 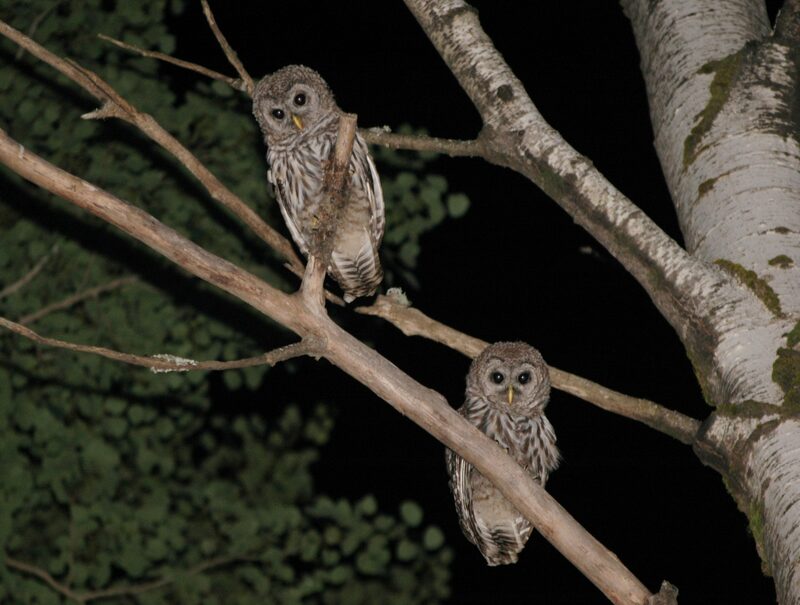 Raptors like the Merlin have been seen at Ashland and Bucktoe Creek Preserve and a Saw-whet Owl was seen near Ashland Nature Center this week. The owl was probably a migrant stopping in for the day. Frogs like Spring Peepers and Wood Frogs have emerged. I had to cheat for the video and catch a Spring Peeper so you could see how they make their incredibly loud sounds. Wood Frogs have laid lots of eggs in local vernal pools. Notice how the Wood Frog vocalizes differently than the Spring Peeper. This weekend, pick a local park, take a walk, and find your own signs of winter and spring. Report back and leave a comment on the blog to let us know what you are seeing, or what your favorite sign of spring is. Installing nest boxes in your yard is a great way to increase your bird viewing enjoyment. 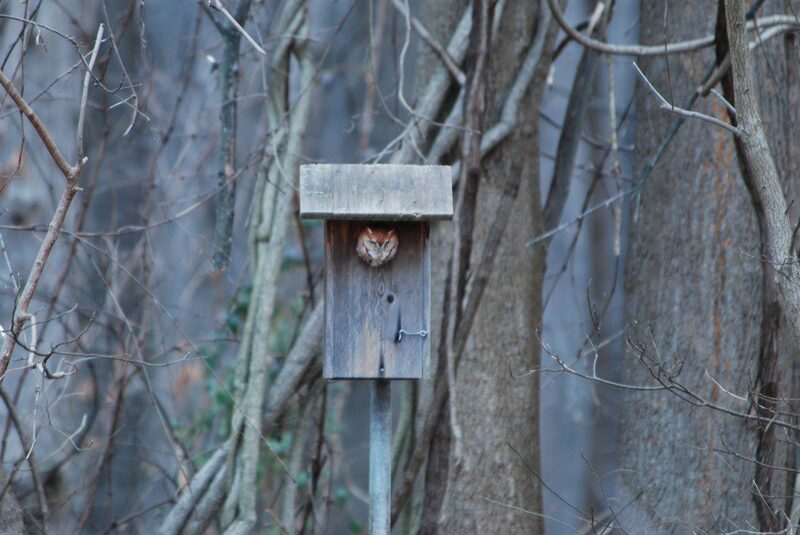 My favorite such box that I recommend for anyone that has a yard near a woodland is an Eastern Screech-owl box. 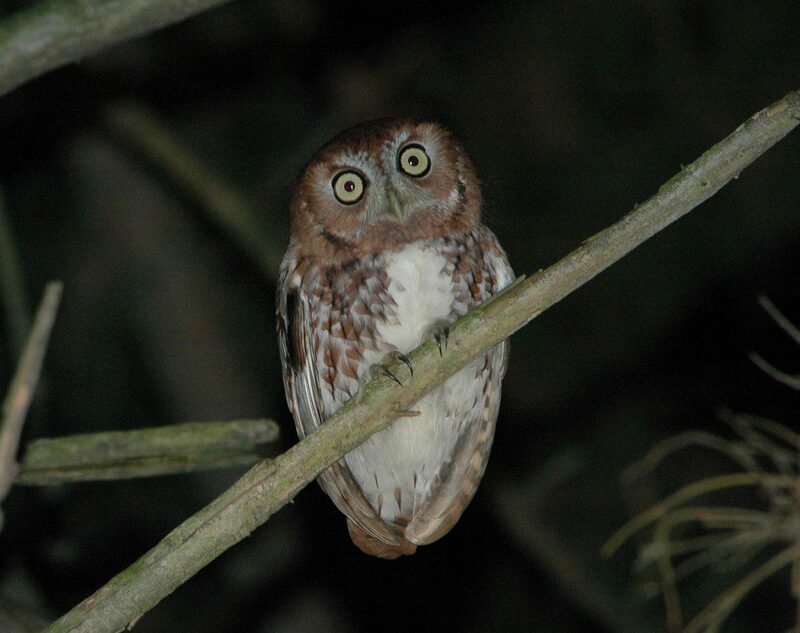 Eastern Screech-owls are one of our most common owls and are found near most woodlands and woodlots in our area. These boxes simulate tree cavities and Screech-owls use them for diurnal roosting and/or nesting. A red phase Eastern Screech-owl peers from a backyard bird box. Photo by Jim White. 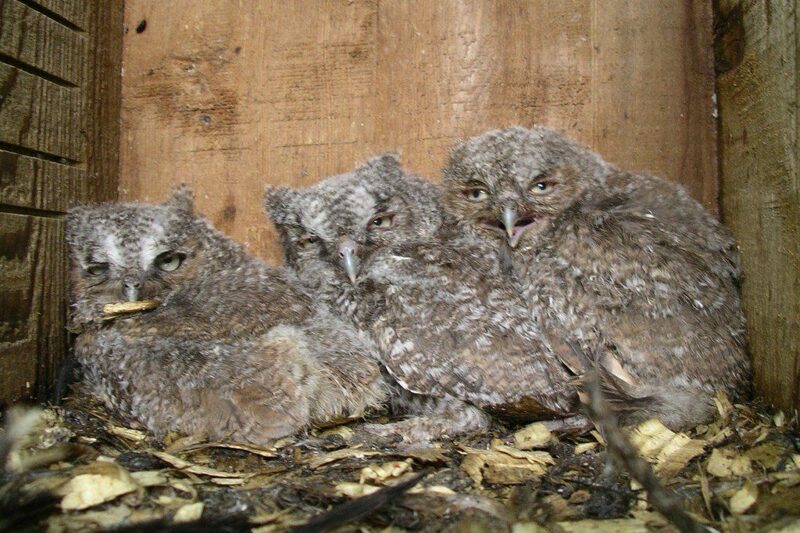 Most of my observations of Screech-owls in boxes are of roosting birds. They often can be seen poking their head out of the box while perched in the entrance hole in late afternoon or just before sunset. Boxes can by placed just about anywhere but should be at least 100 feet from areas of high human activity. I recommend facing the box toward a good viewing spot like a window that you often look out. Also, I like to face the box west toward the setting sun, so they can peer out and warm up late in the day. This will make it more likely that you will see the owl that comes to roost in your box. 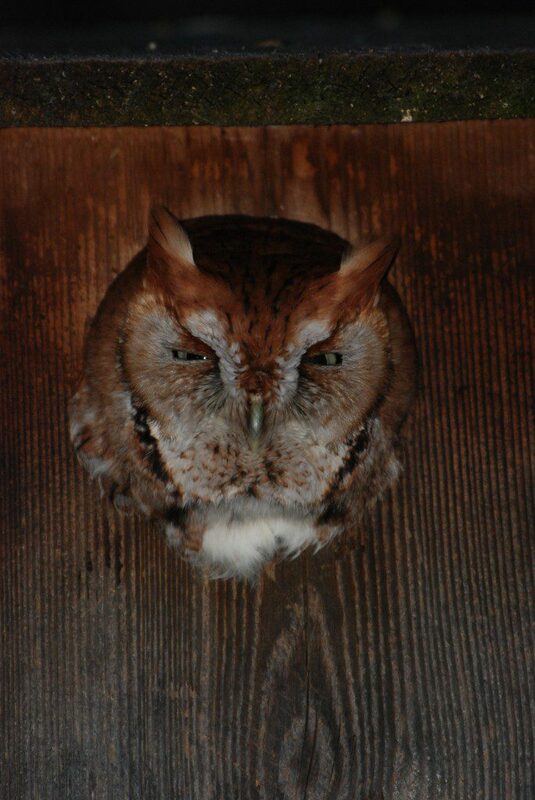 In my experience, Eastern Screech-owls only uncommonly nest in boxes. Nesting begins in mid-March or early-April, so if you see an owl in the box in spring it may well be nesting there. Set up your box so that you can easily see it from a window in your house. Photo by Jim White. Screech-owls require relatively large boxes. These boxes measure 12-15 inches high with floor dimensions about 8 inches square. The entrance hole should be 3 inches in diameter. The box should be placed on a tall, 10-15 foot pole preferably made of steel, but wooden posts can be used. Predator guards are recommended because they keep mammals and snakes out of the boxes. The boxes can be home-made or, if you are like me and lack time and woodworking skills, purchased at a local bird stores or on the internet. Construction plans can be found here. Screech-owls will also use larger boxes intended for nesting Wood Ducks. Good luck with your project. If you have any other questions you can email me at jim@delawarenaturesociety.org. 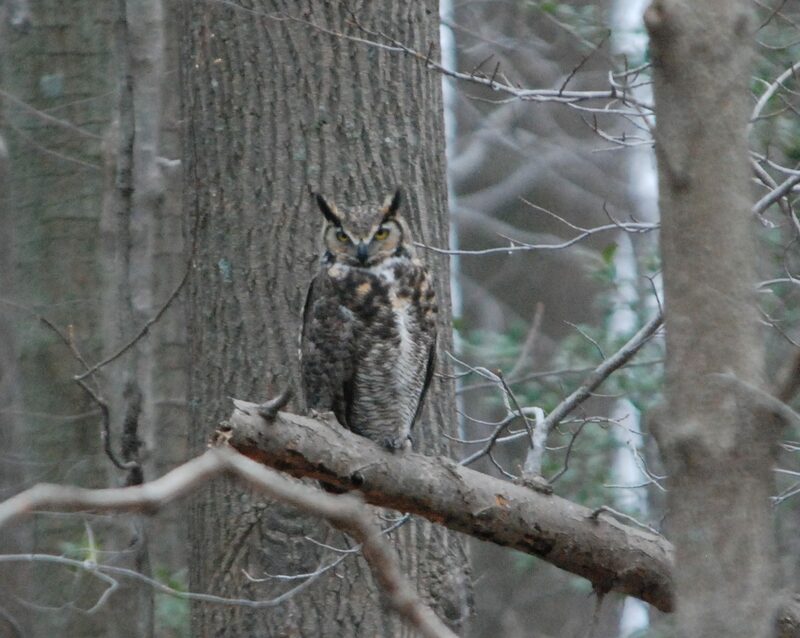 If you are interested in the owls in our area, look for my future blogs in which I will profile each of Delaware’s eight owl species. Also, join me on my annual field trip to try to find all eight species in one day. 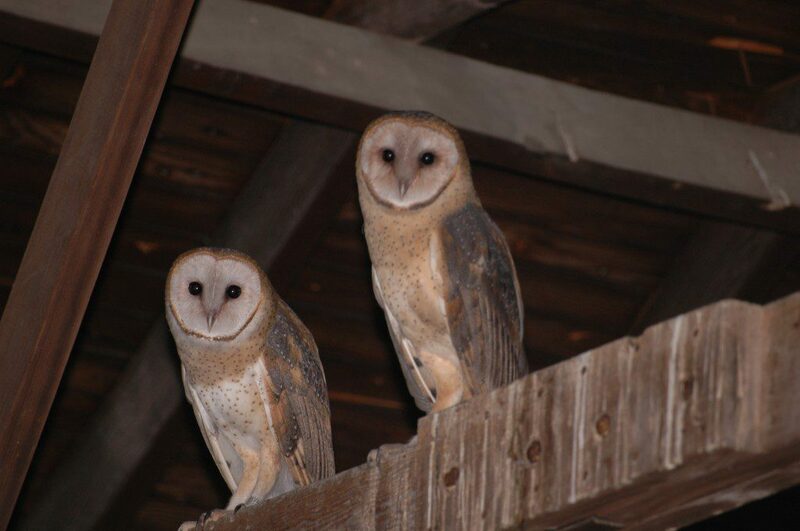 This year, the Owls and Other Winter Raptors trip is scheduled for Sunday, February 14, 8am to 7pm.